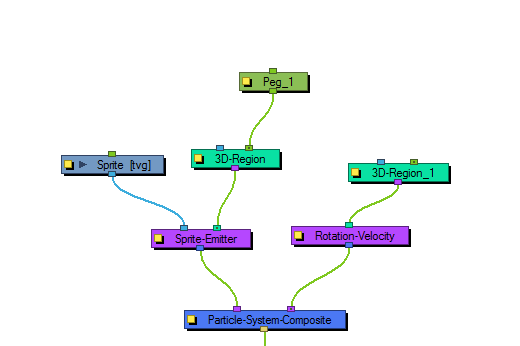 This module allows you to define the initial rotational velocity of the particles. The values that you set up for this module refer to each individual particle's drawing axes. This means that if you choose to rotate around the X axis, it will rotate around each particle's local X axis as defined by its drawing plane. The rotational velocity should be set before you emit the particles, i.e. to the right, so that the velocity is taken into account when the particles are created. 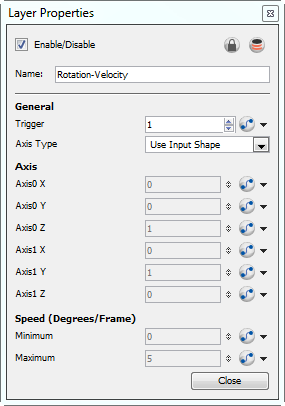 Use the Rotation Velocity's Layer Properties panel to adjust the effect's parameters. • Axis Type: Select the type of axis you would like to use. • Constant Axis: If you choose to rotate the particles around a constant axis, then each particle will rotate around the same axis. This axis will then be defined as Axis0. • Interpolated Axis: If you choose to rotate the particles around an interpolated axis, that means each particle will have its own rotational velocity which lies somewhere between Axis0 and Axis1. • Use Input Shape: Use a region to define the rotation axis of the particles. The axis of each particle's rotation will be perpendicular to the plane that particle is created on. • Axis0 X: Define the X component of Axis0. If you set the X to 1, and the Y and Z to 0, then the particle will rotate around its X axis as defined by its drawing plane. If you set X to 1 and also Y to 1, then it will rotate around an axis that is 45 degrees between X and Y. • Axis0 Y: Define the Y component of Axis0. • Axis0 Z: Define the Z component of Axis0. • Axis1 X: Define the X component of Axis1. This applies only when you have selected an Interpolated axis. • Axis1 Y: Define the Y component of Axis1. • Axis1 Z: Define the Z component of Axis1. • Minimum: Enter the minimum initial rotation that a particle can have, in degrees per frame. • Maximum: Enter the maximum initial rotation that a particle can have, in degrees per frame.